Some infos about the game. 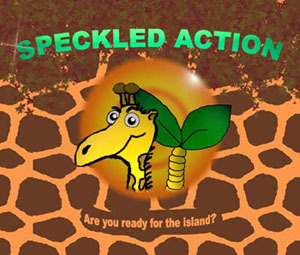 Speckled Action is a - let´s call it - Hit & Run game, which was made for the computergraphics 2/3 course at the Technical University Vienna, where it placed 2nd in the final competition (beside 2 other games). You can take a look at the Hall of Fame 2003. If you are interested in more technical details take a look here. So, what´s the game about. You are playing a giraffe running around an island and collecting rings. You are in contest with other giraffes played by the computer. The one, which has collected a given amount of rings first, is the winner. That sound´s easy? Well, you can also loose the collected rings. If you run over a ring, it´s yours and placed around the neck of the giraffe. You can only carry 5 rings at the same time. As long as the rings are around your neck they are not save. Other giraffes can attack you. Enemies, bad enemies can attack you. Only when you bring the rings to your home they are saved and counting.